Despite best efforts, adhering to New Year’s resolutions can be hard. We often set our goals just a bit too high. When we don’t meet them, often in an instant gratification fashion, we easily give up. When making your goals for new changes in the new year, focus on these ideas to help guide you toward success. > Small changes really do add up to make big differences! For example, if your doctor has told you to watch your saturated fat intake, switch from whole milk to 2% milk instead of making the jump all the way to skim milk. The taste can be quite different and if you don’t like the taste of skim milk you won’t stick to that change! 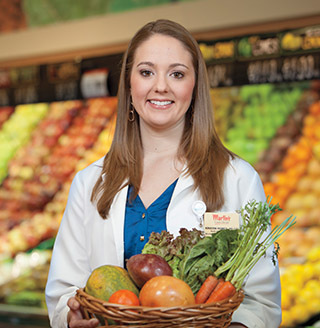 Allow your taste buds to adjust to this dietary change before progressing down to skim milk. Even a small change like this can help you reduce calories to maintain or lose weight over the course of the year. > Make goals you can measure. Having a resolution that says you want to ‘lose weight’ or ‘eat healthier’ isn’t something you can measure your success against. If you are lacking in your fruit and vegetable servings, for example, set the goal of eating an extra vegetable at dinner every evening. Setting goals that are measurable will allow you to see when you’ve met your goals, keeping you motivated all year long! > Focus on the yes. With your diet, for example, what are all the wonderful healthy foods you should be saying yes to instead of the ones you are saying no to? For exercise, think of all the positive things your legs allow you to do, rather than obsessing about their shape; they help me complete my workout that helps drive other healthy behaviors. Focusing on the positive may make you feel less restricted. Always remember – no one is perfect. You are going to slip up and that’s ok! A slip up doesn’t mean you have to give up. 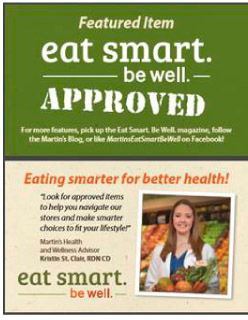 Look for Eat Smart Be Well approved items tagged throughout the grocery store. These items have received my stamp of approval for allowing you to navigate our stores a little easier for smarter choice to fit your lifestyle.